"The art of life is to know how to enjoy a little and endure much." We had a lot of things we wanted to do in the short time we're in Colorado Springs, and we packed a bunch of it in over three days. And then we added a fourth day, which makes it possible for me to hike as far up Pike's Peak tomorrow as I can get. Check back later for photos from that adventure. I'll explain in a little bit why we decided to stay in the Springs for another day. 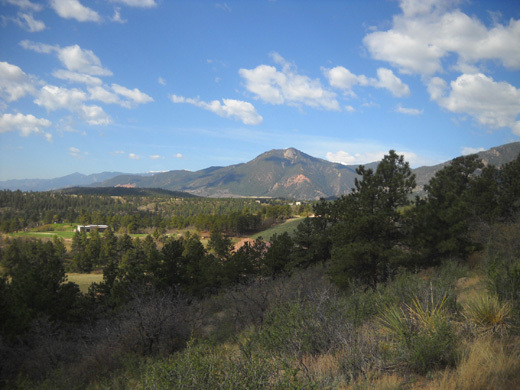 View of the mountains and Academy grounds from one of the ridges on the Falcon Trail. We've had great weather for all of our activities since we arrived Thursday afternoon -- mostly sunny with temps in the 40s to 70s F. Our weather radio warned us of a tornado east of the Springs last evening but all we got at the Academy was a little bit of rain overnight. This evening the winds were gusty enough that I didn't go on a planned bike ride. Let's start with the fun stuff -- running, hiking, and cycling. 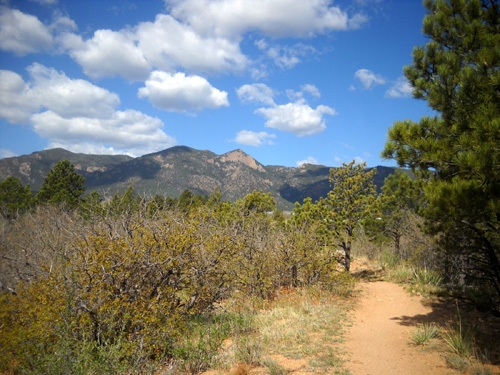 Last year we discovered the Falcon Trail, a really nice 13-mile multi-use, mostly single-track loop that courses through the USAF Academy grounds. 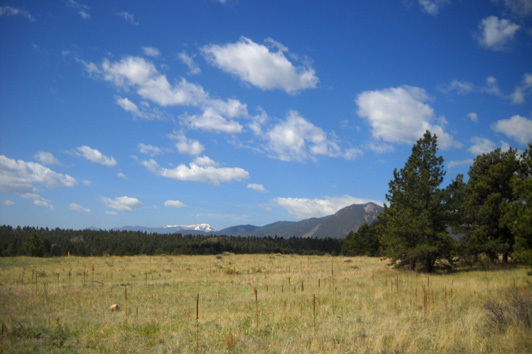 We can access the loop easily from the campground -- about a half-mile jaunt from our campsite -- and it gives us a great workout of any length over varied terrain. If we want a shorter workout, we go out-and-back in either direction. If we want a longer one, we can add distance to the basic loop. On Friday morning Jim hit the Falcon Trail for a five-mile run/walk early enough to avoid a drove of cyclists. 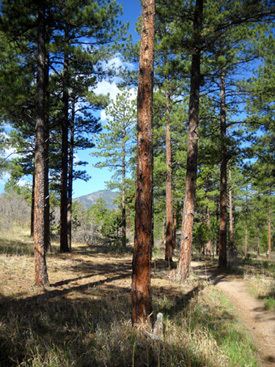 We see more mountain bikers on this trail than runners, hikers, and equestrians combined. The bad news is that Jim's knee has begun hurting the last couple of days, the first since he got a steroid shot April 12. It didn't hurt during the Jemez race last weekend or for several days afterward. That has him very concerned, of course. We're a long way from our orthopedist in Roanoke and Jim wants to continue training for the Bighorn 50-miler in three weeks. Cody and I took a five-mile hike on the Falcon Trail that morning also, but we took a lot longer than Jim did. We saw five cyclists and no one else. Because of the cyclists, I keep Cody on his leash all or most of the time on this trail so he doesn't get run over or cause an accident. When we were almost done we saw a coyote in the middle of the trail. Cool! At first, I thought it was a dog running ahead of its owner. Cody had already become alert at least a minute before I saw the coyote; he must have smelled it or another one. As with dogs, I told him to "leave it" and he heeled nicely. Jim plans to get back out on the Falcon Trail again tomorrow to see how his knee feels. I probably won't be walking on it any more this visit. At least once a day, usually after supper, Cody and I walk around the campground. If Jim's knee doesn't hurt, he joins us. We can easily get in at least a mile that way and it's a fun way to meet people. In the last entry I talked about my 16-mile bike ride on Friday and Jim's and my shorter ride (7 1/2 miles) on Saturday. His knee didn't hurt during the ride but he hesitates to do any more cycling while we're here because he isn't used to riding that much and he wants to let his knee heal. I've also done a couple of shorter rides through the campground and on a rather flat part of the single-track Falcon Trail. I either need knobbier tires on my TriCross bike to do any more cycling on the Falcon Trail or I need to ride Jim's old Trek mountain bike so I have more grip on the loose grit. Ahh. There's a pleasant activity! We don't eat out much but when we do it's usually either authentic Thai food or pizza. Last summer we discovered a very good Thai restaurant nearby. It's called Thai Basil and it's located on N. Academy Blvd. 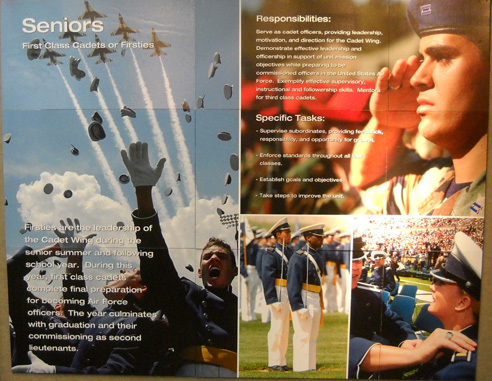 near the south entrance to the USAF Academy. We love this little place, which is part of a chain of seven Thai restaurants in the Denver-Colorado Springs corridor. The food is excellent and the lunch prices are low. So that's where we headed for lunch on Friday. 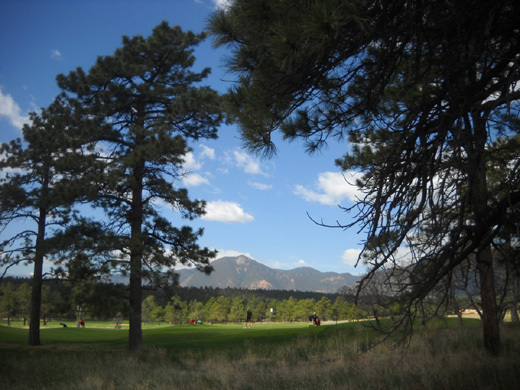 The Falcon Trail loops around the golf course at the USAF Academy. We really get our money's worth at this restaurant. One way we save on restaurant meals is to eat out at lunch instead of dinner. At Thai Basil we each order one lunch item to eat there (at $6.50-$6.75 per entree) and order another one to go. That's four lunches. We turn them into eight meals, however. There is so much food that we eat half an entree in the restaurant, then take half home to eat later. Same thing happens to the extra entrees we take home; we eat just half at one meal. That makes each serving less than $3.50. Oh, and we also get a spring roll with each entree. We enjoyed those meals so much that we returned today to get four more lunch entrees to freeze and eat later. Once again, that will make eight meals for us. Just about any store you can imagine can be found within one or two miles of the south gate of the Academy on N. Academy Blvd. One of our favorites is REI. On Friday we stopped in to hunt for several specific items. We ended up purchasing only two things. We were each able to use our 2010 member dividend and a 20%-off Memorial Weekend coupon. I got another pair of convertible pants (with zip-off legs) that are great for hiking, cycling, and any type of casual activity; Jim got a sun hat with cape to replace one he wore out. The store was packed with shoppers taking advantage of the holiday sale coupon. We've also been to Walmart and Sam's Club on N. Academy Blvd. a couple times each, Whole Foods, and the BX on base. When Jim went to the BX on Thursday he picked up a flyer with specials and activities scheduled for Memorial Weekend. 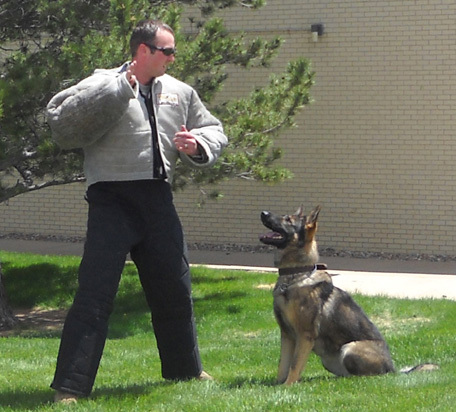 One of the things we were interested in was a 15-minute "working dog" demonstration by the Academy Security Forces scheduled for Friday afternoon. 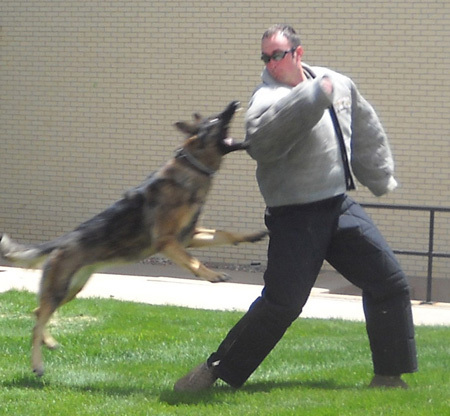 A trainer put Boda, the young female German shepherd shown in these photos, through her paces in the parking lot while several dozen folks watched. 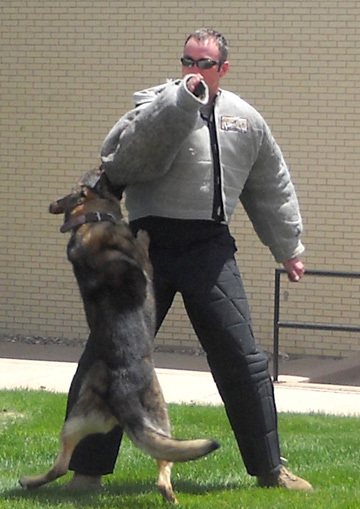 Another sergeant acted as a decoy, wearing a protective jacket and pants while Boda showed what she can do to bad guys! Boda has an amazing grip with her teeth and simply doesn't let go, even when "Bad Guy" swings her around in circles! 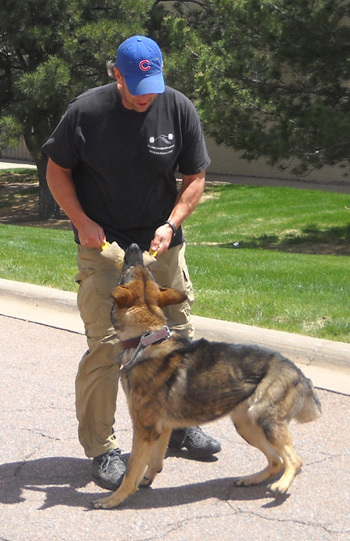 Boda is trained to detect fifteen different odors that may be used in bombs and will protect and/or attack the enemy. 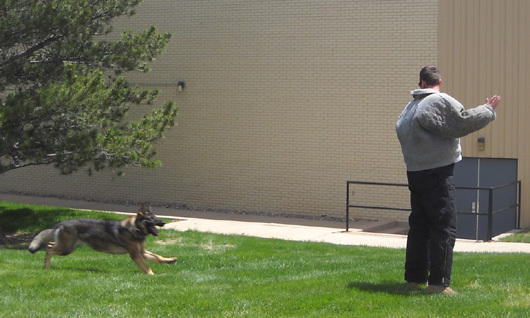 She will probably end up in Afghanistan or another combat zone to protect troops and detect IEDs. 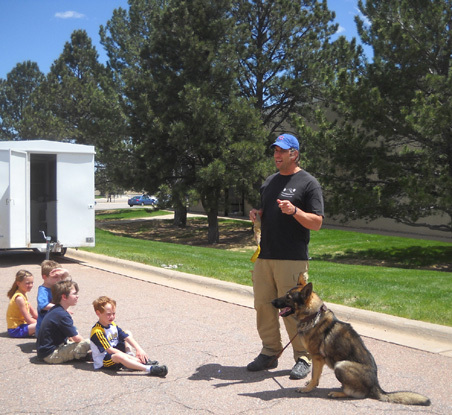 It was an interesting demonstration. I wrote about the visitor center on base last year and showed some photos of it. I highly recommend seeing it if you're ever in Colorado Springs (all you need is a valid driver's license to get on base). One day Jim drove to the visitor center to see if there was any information about Lance Sijuan, who was killed while a POW in Viet Nam. Jim read a very good book about him called, "Into the Mouth of the Cat," which was written by Malcolm McConnell. Someone on the ultra running list recommended it as a good read. Sijuan was trained at the Academy but there wasn't as much information about him in the visitor center as Jim hoped he'd find. 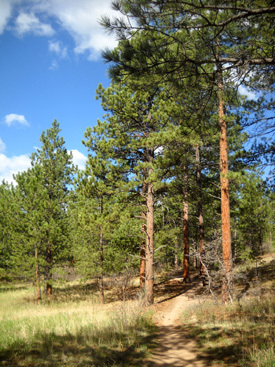 We originally had reservations at the Foothills CG in Dayton, WY for the two weeks before the Bighorn Mountain Wild & Scenic Trail Runs. Sometimes we've gotten there three or four weeks before the race when the weather is good and we can get into the mountains to train on the course. This year is very different. Many parts of the Rockies, Cascades, and Sierras received huge amounts of snow, some record-breaking, over the winter and spring. 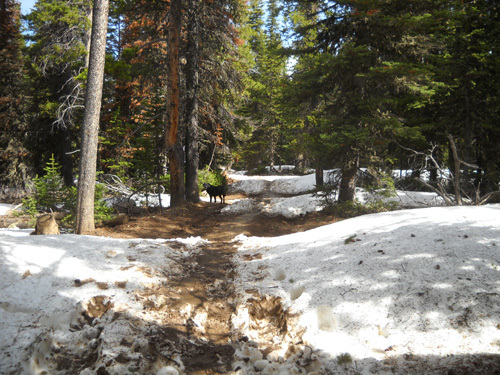 The snow pack in the Bighorn Range is much higher than normal for late May. Right now at Burgess Junction, which is "only" about 8,000 feet in elevation, the snow pack is 317% of normal. It's no better higher up on the Bighorn race course. 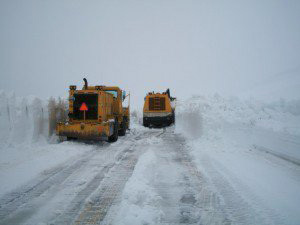 Jim found a graphic photo of US 14A, the highway between Burgess Junction and the Porcupine Ranger Station, that shows road crews fighting the snow and trying to get the road open to Lovell, WY. It was open, but then another two feet of snow fell recently. Drifts are up to 20 feet deep in some places and there is also a large landslide that has to be cleared. 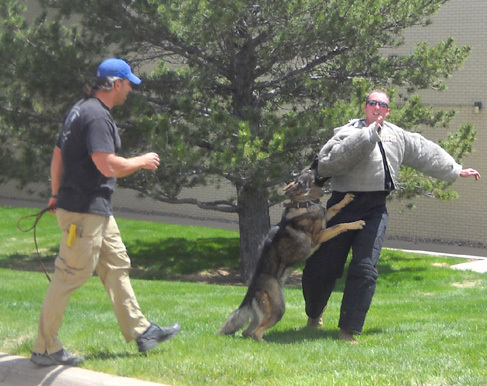 You can see that photo larger at the link above, and read the Sheridan Star-Tribune staff report about the situation a/o May 26. Obviously, all this snow means higher-than-normal snow melt this time of year. Even in a normal year the Bighorn course is a wet mess in many places from snow melt. 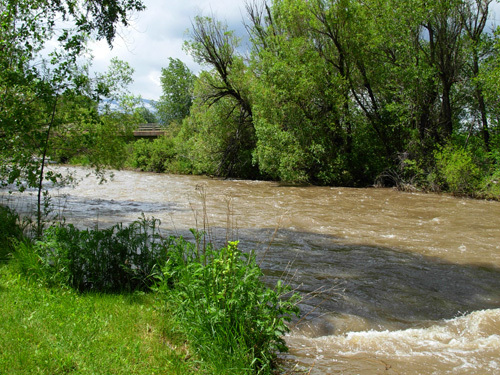 Compounding the problem in Montana, Wyoming, and the Dakotas is higher-than-normal amounts of recent rainfall, too, with up to several inches falling in a day. Flooding has become a major issue in these states, to the extent that even a large chunk of I-90 between Billings, MT and the WY border has been closed for several days. while helping clear the course a week before the 2007 Bighorn race. Of particular concern to Jim right now is the condition of the Bighorn course. Race staff is unable to access the trails at the higher elevations and the streams are flooded. There's no way we're going to be able to get out on very much of the course in the next two or three weeks. We haven't heard any talk about canceling the race, but it's quite possible that even the "snow route" of 2008 won't be accessible this year. We're wondering what the race staff will come up with. Since I'm not running the race, my main concern is flooding at the Foothills CG. The Tongue River flows along the eastern edge of the property where the tent sites are located (and along the last few yards of the race course in adjacent Scott Park). Although the full-hookup sites where we'll be parked are farther from the river, they aren't that much higher and could easily get flooded, too. My nightmare is that we'll get parked, the river will continue rising (it's highest during the night), and one morning we'll wake up and be surrounded by water. High water in the Tongue River laps at the banks of Foothills CG in June, 2007. Meanwhile, there is a very high chance of heavy rains today and tonight in eastern Wyoming and western South Dakota. 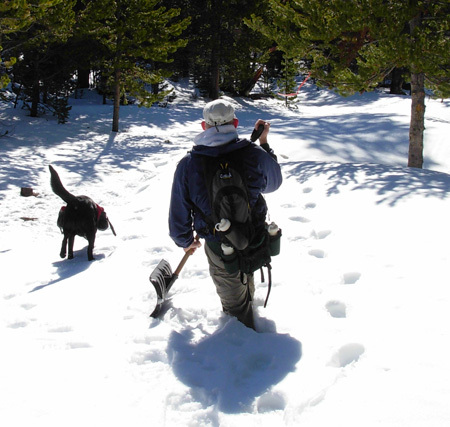 Several inches of snow are predicted for the Bighorns. Just what they need . 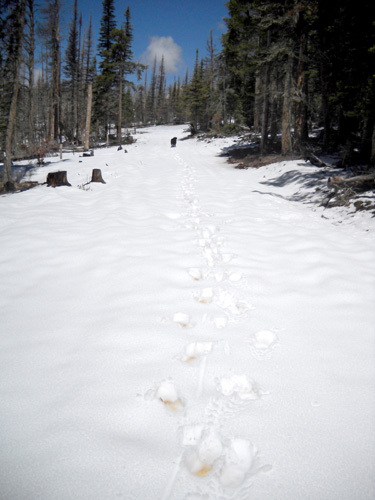 . .
We've decided to postpone going to the Bighorns until June 13, five days before the race. We plan to hang out in the Black Hills/Rapid City, SD area for a week so we can continue enjoying trails and (hopefully) better weather. Considering what the Bighorn course has looked like in previous years with more normal snow pack, it's doubtful we'll be able to run/hike on any of it besides the Tongue River Canyon. Of course, there is a high risk of flooding in the Black Hills, too, but at least it isn't still snowing! just a week before the race. 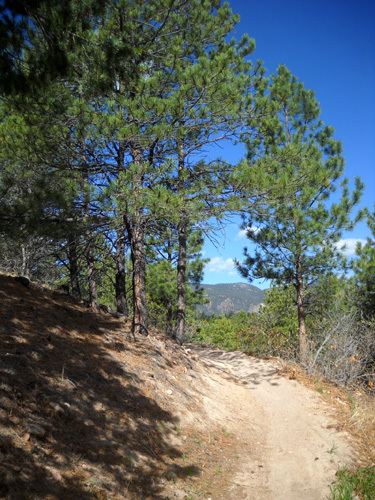 This is the trail going to Riley Point (50K course). The Bighorn Mtns. have received much more snow this year. A further modification is to to stay at the Academy another day instead of driving through eastern WY and western SD tomorrow. If we drove tomorrow, Memorial Day, we could avoid most of the work traffic in Denver. However, tomorrow's forecast is for high winds and a 50% chance of thunderstorms in NE Wyoming and the Rapid City, SD area. It's dangerous to drive an RV in those conditions. So we'll wait until Tuesday when the weather is expected to be good -- and just brave the metro traffic. Plan A is to camp at Wind Cave National Park for the first two or three nights. We can't make reservations, however, so if we aren't able to get a suitable spot there, Plan B is to head for our next destination, Ellsworth AFB, and stay there for about a week. We can drive back down to the park one of the days we're in Rapid City. Oh, yeah. We can't reserve a spot at Ellsworth, either . . . We'll have to trust our luck in getting a spot there for a few days. How long we stay in South Dakota depends on what the weather does there and in the Bighorn area, and when the new camper tires we ordered from Sam's Club come in. 7,800 feet. Will this part of the course be navigable this year with a much higher snow pack?? With this lifestyle we always have to be flexible. Sometimes that's fun. Other times it's nerve-wracking. 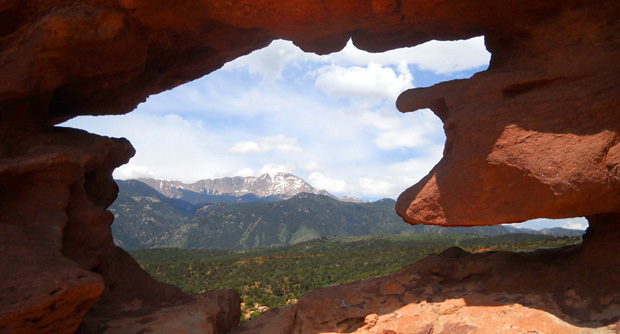 The good thing about being flexible this week and adding a day to our stay here in Colorado Springs is that I have the opportunity to hike on Pike's Peak tomorrow. I love Pike's Peak. There is minimal chance for rain or high winds and temperatures should reach the low 70s F. again in the Springs -- perfect for a hike. Jim plans to hit the Falcon Trail again tomorrow and see how his knee feels. He's got a race to run soon . . .